The Silver Surfer is a fictional Character, a superhero appearing in comic books and other publications by Marvel Comics. Originally a young astronomer named Norrin Radd on the planet Zenn-La, he saved his homeworld from the planet devourer, Galactus, by serving as his herald. 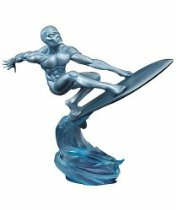 Imbued in return with a tiny portion of Galactus's Power Cosmic, Radd acquired vast power, a new body and a surfboard-like craft on which he could travel faster than light. 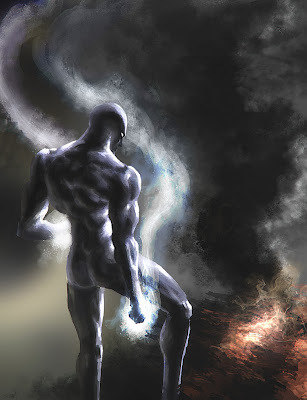 Now known as the Silver Surfer, Radd roamed the cosmos searching for planets for Galactus to consume. When his travels took him to Earth, he met the Fantastic Four, a team of powerful superheroes who helped him rediscover his humanity and nobility of spirit. Betraying Galactus, the Surfer saved Earth but was exiled there as punishment. 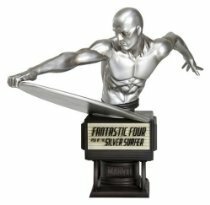 In 2011, IGN ranked Silver Surfer 41st in its "Top 100 Comic Heroes" list...more about Silver Surfer Character Review...keep reading !! The Silver Surfer wields the Power Cosmic, granting him superhuman strength, endurance, senses and the ability to absorb and manipulate the universe's ambient energy. The Surfer can navigate through interstellar space and hyperspace, which he can enter to exceed the speed of light when flying on his board. He has proven capable of time travel on several occasions, even able to make others time-travel with him. The Surfer sustains himself by converting matter into energy; does not require food, water, air, or sleep (although he occasionally enters a sleep-like meditation in order to dream); and can survive within nearly any known natural environment, including deep space, hyperspace, and even within black holes and stars. The Surfer can project energy in various forms for offensive and defensive use, including bolts of cosmic force powerful enough to destroy entire planets, and create black holes. He can utilize the Power Cosmic to augment his superhuman strength to indeterminate levels. The Surfer can heal living organisms, though he cannot raise the dead, and he has proven capable of revitalizing and evolving organic life on a planet-wide scale. He can cast illusions, create interdimensional portals and microverses, phase through solid matter, and exercise some level of control over the Astral Plane. The Surfer's board is composed of a nearly impervious, cosmically powered silvery material that is similar to his own skin. The board is mentally linked to the Surfer and moves in response to his mental commands even when he is not in physical contact with it. The board is nearly indestructible, but on those rare occasions when it has been damaged or destroyed, the Surfer has proven able to repair it, or even recreate it, with little effort. The Surfer can attack opponents remotely by directing the board against them, and the board is capable of absorbing and imprisoning other beings, at least temporarily. When Galactus exiled the Surfer to Earth, his means of imprisonment was linked to the board. When the Surfer and the Fantastic Four realized this, the Surfer put it to the test by leaving the board planet-side and entering space in the Four's spacecraft. Once he was free of Earth, the Surfer remotely converted the board to energy, recalled it to him, and reformed it in space. Norrin Radd also possesses some knowledge of the advanced alien technology of the planet Zenn-La. In the 1983 film Breathless, Jesse Lujack (Richard Gere) is a drifter in Las Vegas, obsessed with the Silver Surfer, the rock and roll music of Jerry Lee Lewis and Monica Poiccard (Valérie Kaprisky), a UCLA architecture undergraduate whom he knows only from a weekend fling in Vegas. The Silver Surfer was the primary inspiration for Lujack's strong sense of love, loyalty, identity, free-spirit, and self-determinism at all costs, even to the point of self-destruction. 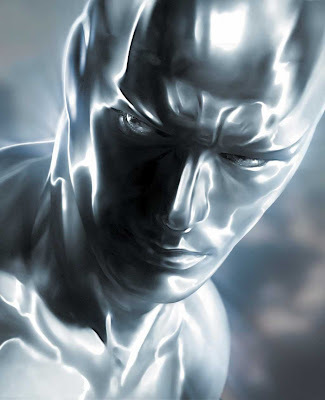 In 1991, Erik Fleming and Steven Robiner, two film students from the USC School of Cinematic Arts, approached Marvel Studios and producer Bernd Eichinger to ask permission to make a short film featuring the Silver Surfer as a proof of concept for the use of CGI in creating a realistic silver coloured human figure. This short film, completed in 1992, not long after the release of Terminator 2: Judgment Day that featured a similarly rendered character, led to significant interest from major studios in a feature length Silver Surfer project. The Silver Surfer made his film debut in 20th Century Fox's Fantastic Four: Rise of the Silver Surfer, the sequel to the 2005 film Fantastic Four. Doug Jones played the Surfer on set, and a computer simulation enhanced the reflective look of his prosthetics. Laurence Fishburne provided the character's voice. The same year, 20th Century Fox hired J. Michael Straczynski to write the screenplay for a spin-off film. Straczynski said his script is a sequel, but will also delve into the Surfer's origins. In mid-2009, Straczynski expressed doubts that spin-off would be produced. In this continuity, the Surfer's origins and powers are similar to those of his comic-book incarnation, in that he agrees to become Galactus' herald in return for the safety of his home world and the woman he loved. Also, if the Surfer is separated from his board, he becomes weaker; in addition, the board also serves as a beacon for Galactus.